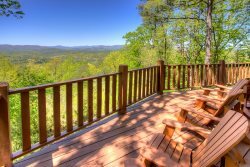 You will love the private setting of Bear Creek, a 3 Bdr Vacation Cabin Rental just 7 miles north of Helen, surrounded by tons of Mountain Laurel on a beautiful secluded and wooded lot. Bear Creek is also conveniently located just 4.5 miles to The Cottage Winery and 8 miles to Kellum Valley Farms -- a perfect choice for wedding groups. With the Richard Russell Scenic Highway and Smithgall Woods just 3.5 miles away, Bear Creek is a wonderful location for bikers, hikers, and anglers of all ages. And Helen lies just beyond with great local restaurants, shopping and activities for everyone! This comfortable cabin rental offers a king bedroom and full bath on the main floor, along with the living, dining and kitchen areas. The huge brick fireplace in the main living area is perfect for those chilly Autumn nights, and throughout the winter season! The upstairs level has a large king bedroom and a queen bedroom, separated by a full bath. Enjoy the covered porch on the front of the cabin, complete with rocking chairs and a porch swing . 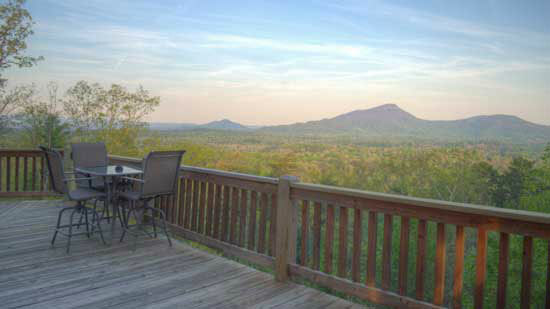 . . or the back covered deck with outdoor table/seating and gas grill. Rain or shine, the covered porch or deck are the perfect spots for relaxing, and enjoying morning coffee, and a healthy dose of fresh mountain air! Come stay at Bear Creek and experience this wonderful blend of a great cabin, beautiful setting and a convenient location! We loved staying at Bear Creek!